Not so long ago, green cleaning was far from a priority for many in the industry. In a sector driven by practical concerns, it was largely considered a novelty. Times have changed dramatically. Environmentally sound cleaning practices and products have a solid presence in the industry, and recent studies have shown consumers are increasingly willing to pay more for green products and services. As a result, many janitorial operations are increasingly focused on offering green cleaning services to clients. 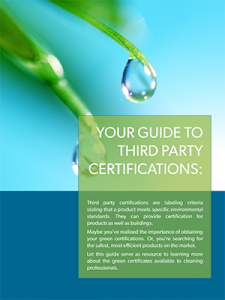 Third-party certifications are a great way to guide, confirm, and leverage green cleaning practices. Once you start looking, however, you’ll realize there’s a big world of green certifications out there, attached to everything from products to entire buildings. Sorting through them all is a big task, so here are a few of the biggest names you should know. This independent, nonprofit organization has been working to certify products and services for more than a quarter of a century, and is one of the best recognized eco-friendly names. 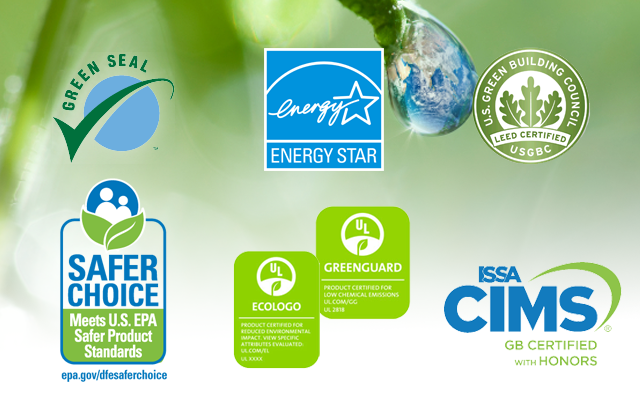 The rigorous standards of Green Seal apply to a huge range of items, including cleaning and paper products. Green Seal also offers a certification for cleaning services, GS-42. This standard is a “systems approach” to cleaning, covering the products and practices of a BSC. To earn this certification, complete the certification checklist, provide documentation and plans, and prepare for an on-site audit. You’ll pay evaluation and compliance inspection fees, which are on a sliding scale according to annual revenue. Green Seal certifications for products and services can be used to earn points towards LEED certification (more on that later). The Environmental Protection Agency (EPA) administers this certification program for products. For 15 years, the certification was known as the Design for the Environment, or the “DfE,” label, but was recently rebranded as Safer Choice. There are three Safer Choice labels—general use, products for institutional/industrial use, and fragrance-free products. All three are worth seeking out, but BSCs may be most interested in the institutional/industrial use label. The EPA sets strict scientific standards that chemicals must meet. Criteria include “products that perform well and are safer for human health and the environment” and labeling with ingredient disclosure. Read the complete Safer Choice Standard here. UL is an independent global scientific safety company that helps certify products and services for a variety of safety standards. The two most important to cleaning professionals are EcoLogo and GREENGUARD. These highly regarded certifications indicate a serious commitment by manufacturers to submit their products to “rigorous scientific testing, exhaustive auditing, or both” to prove environmental safety. The ECOLOGO label certifies that a product has met “multi-attribute, life cycle-based sustainability standards.” This means the UL looks at its safety in use, but also at how it’s manufactured, its environmental repercussions upon disposal and more. GREENGUARD is a certification for products that can meet a strict chemical emissions standard—important for any facility looking to improve its indoor environment. Energy StarAnother EPA standard, the Energy Star label can be applied to both products and buildings. Energy Star-certified products meet a high standard of efficiency in their energy use, which reduces carbon emissions. It’s also possible to earn an Energy Star for a facility by putting together an energy-efficiency plan. This plan will likely go far beyond cleaning, but efficient cleaning tools and practices play an important role. Learn more about Energy Star certification for buildings here. The International Sanitary Supply Association (ISSA) administers the Cleaning Industry Management Standard (CIMS) Certification Program. The CIMS-GB Green Building certification is specifically for cleaning organizations. It offers huge value to clients because it’s designed to help them meet Leadership in Energy and Environmental Design (LEED) standards and earn points towards their LEED certification. To earn this certification, create a green cleaning plan that covers products, equipment, staffing levels, and more. You’ll need to agree to an on-site audit from a third party, which will include a documentation review, interviews with workers and clients, and random visits to buildings. Once the assessor verifies you meet the standards, you’ll be granted certification. You can see the full criteria here. The ISSA does not charge an extra fee for this green certification; you can opt into the GB program for the same price as the general CIMS certification . The US Green Building Council runs the LEED green building certification. It’s a comprehensive program that covers everything from planning and construction to maintenance. Buildings earn credits towards their LEED rating for making environmentally friendly choices. As a cleaning professional, you’re most likely to have dealings with the LEED Operations and Maintenance (O+M) ratings system for existing buildings. Using products with and gaining third-party certifications will make you more attractive to potential clients and employers because you can help them earn their LEED rating. A green-cleaning program is a prerequisite for many LEED credits. It’s also possible for an individual to earn a LEED Accredited Professional (AP) credential, which will make you a valuable asset throughout the certification process. As a BSC, a certification helps you prove your standards and commitment to eco-friendly cleaning. That’s a major selling point that can help you create a solid niche. If you’re part of an in-house cleaning department, there’s a good chance that your facility has (or could use) a green directive. Green-certified products and practices will be a big part of that plan. No matter what role you play in the industry, understanding these certifications will give you an edge over the competition. Download your guide to Green Certifications! Let this guide serve as a resource to learning more about the green certificates available to cleaning professionals.